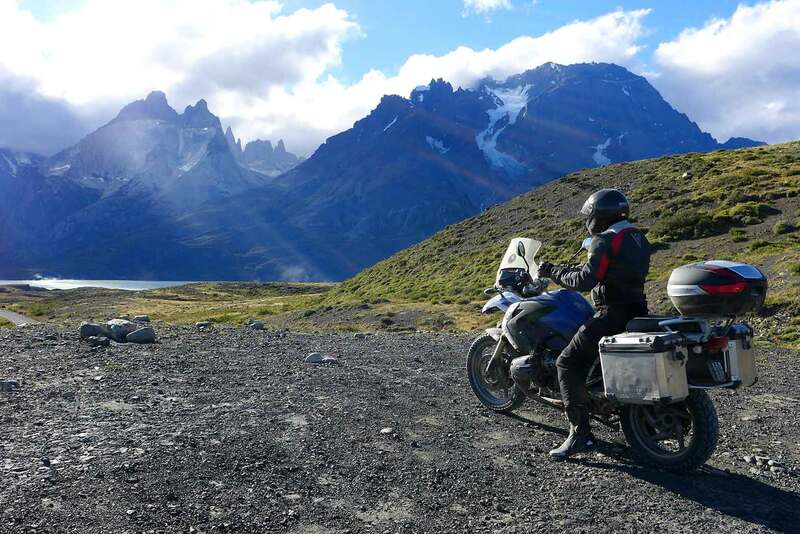 Our 15-Day Ushuaia – Discover Patagonia Adventure begins in Bariloche and ends in Ushuaia, Argentina – the “end of the earth” and as far south as it’s possible ride a motorcycle anywhere in the world. 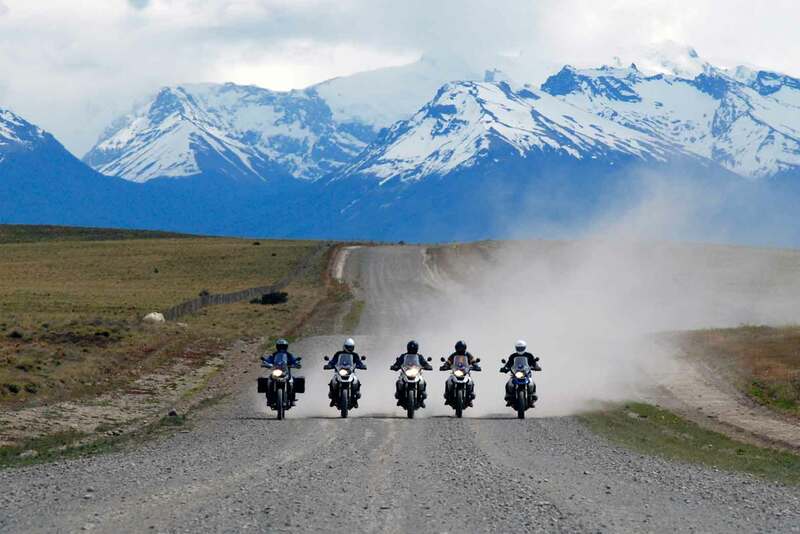 This Adventure is classified a “Discovery Tour” that includes significant portions of dirt and gravel as well as the possibility for the legendary Patagonian winds. 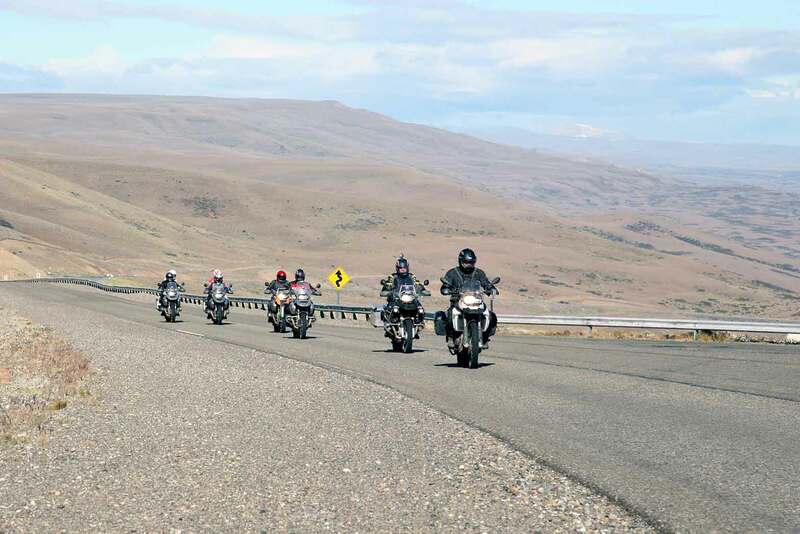 The tour is recommended for experienced riders only, especially for riders who are taking a passenger and riding two-up. Although this is classified a discovery tour, premium level accommodations and restaurants are used for our kickoff in Bariloche, our final celebration in Ushuaia, and for several locations offering premium level accommodations along way. 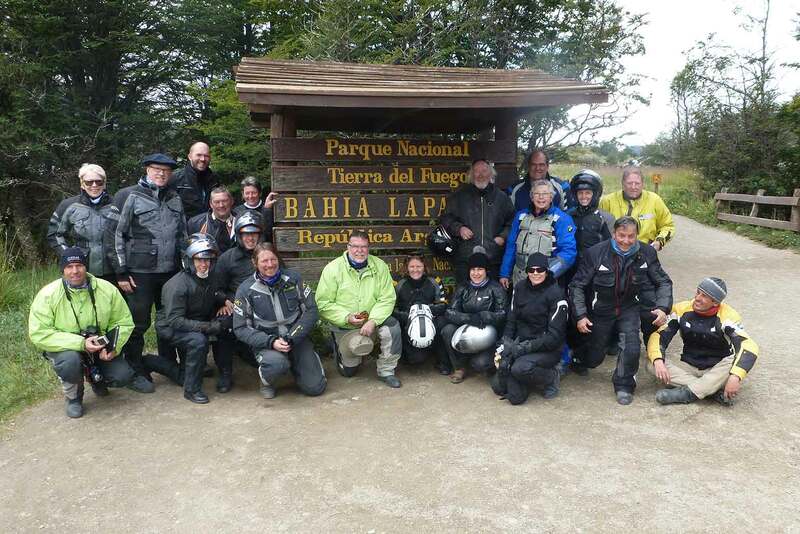 This tour begins with a two-night stay at a five star lodge in Bariloche. Like many of our Discovery Tours, this Adventure can be described as “dusty by day, but bedazzled by night”. Although the itinerary of this trip includes some very small towns in which our typical premium-level accommodations are not available, the overall premium-level accommodations and meals truly qualify this as a premium adventure. A two-night stay in Bariloche – one of the most popular vacation spots in all of Argentina. 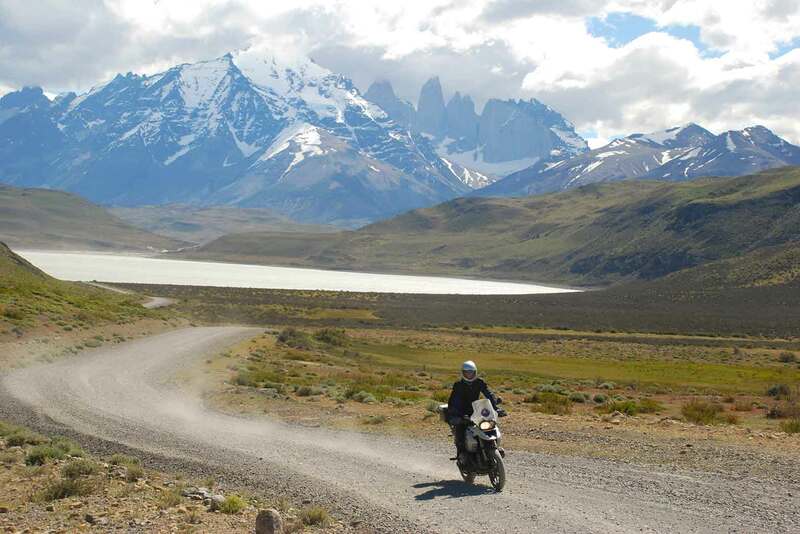 The two-night stay provides a free day to explore the magnificent motorcycling roads that surround this beautiful area, including a loop around the seven lakes at Bariloche. Los Alerces National Park – famous for its ancient trees and spectacular scenery. 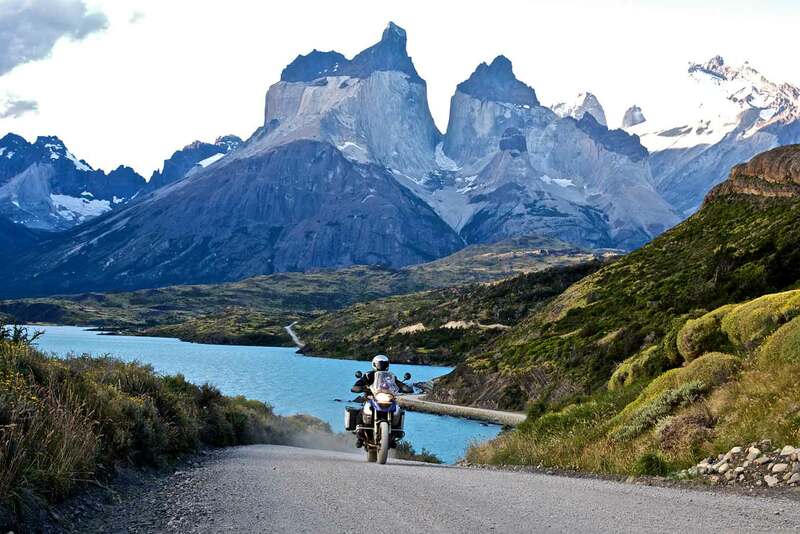 Fjords, rain forests and pass roads on the Chilean side of the Patagonian Andes. 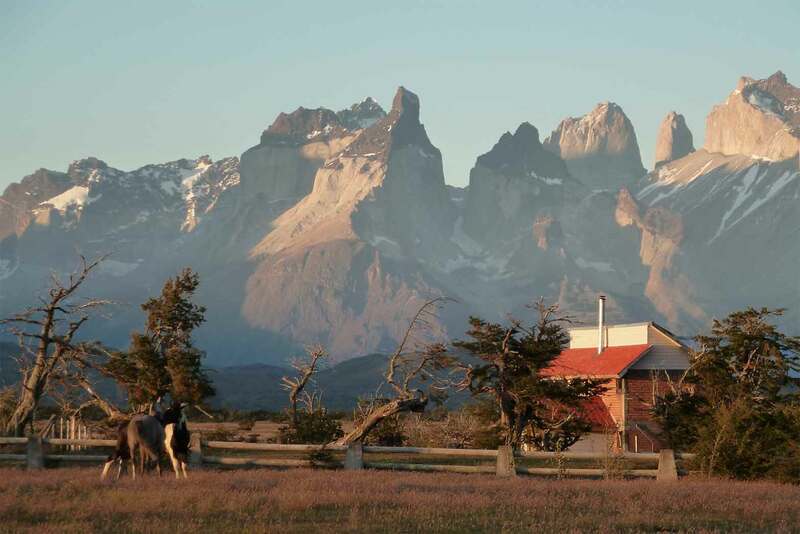 The Argentine village of El Chaltén and surroundings, situated at the foot of the famous Fitz Roy Mountain Range. A two-night stay in El Calafate, Argentina. The free day provides the opportunity to visit one of the most popular attractions in South America – the Perito Moreno glacier. 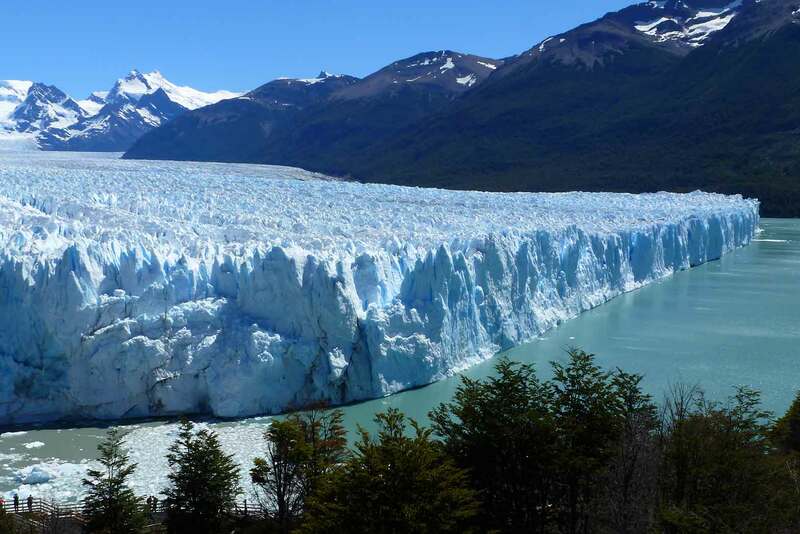 At the Perito Moreno Glacier, guests will view one of the largest and most impressive glaciers in the world, where huge chunks of ice “calve” and crash into the water regularly. 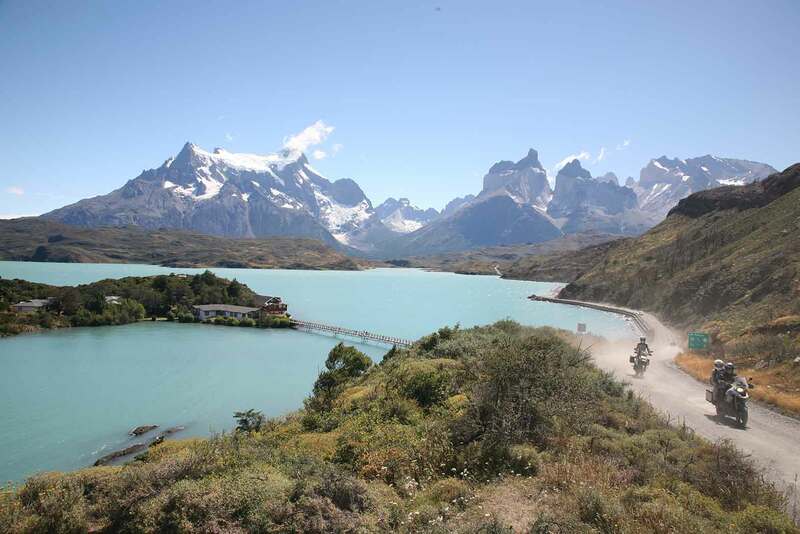 Torres del Paine National Park – the most famous National Park in South America. We’ll stay at a hotel situated next to a charming river with a great view of the park’s spectacular mountains – the “Torres del Paine”. 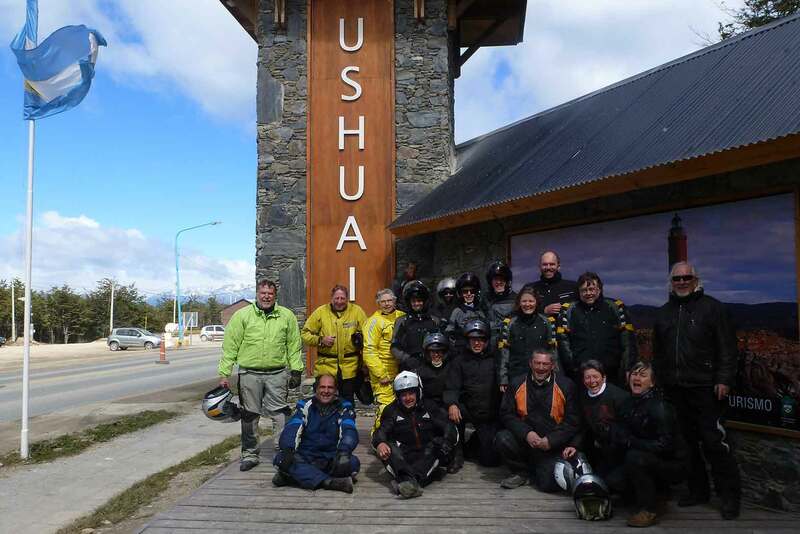 Ushuaia – “El Fin Del Mundo”. 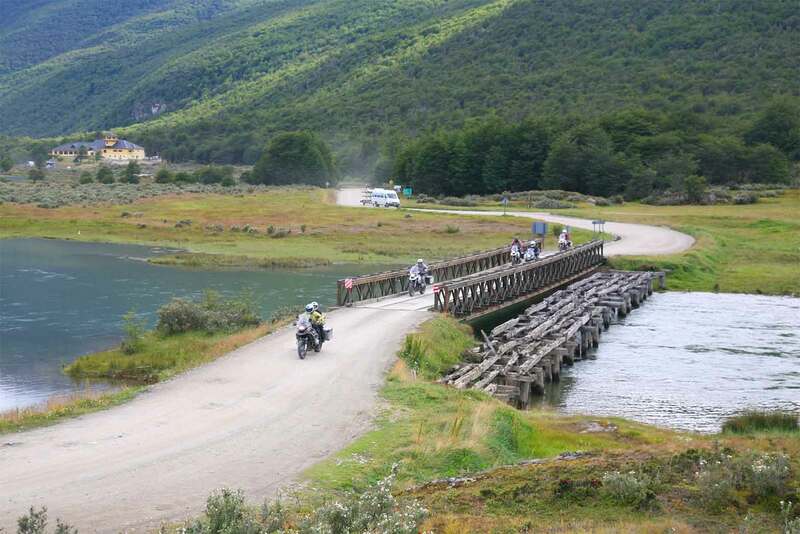 Riders will have time to explore this marvelous part of the world, including Tierra del Fuego National Park. 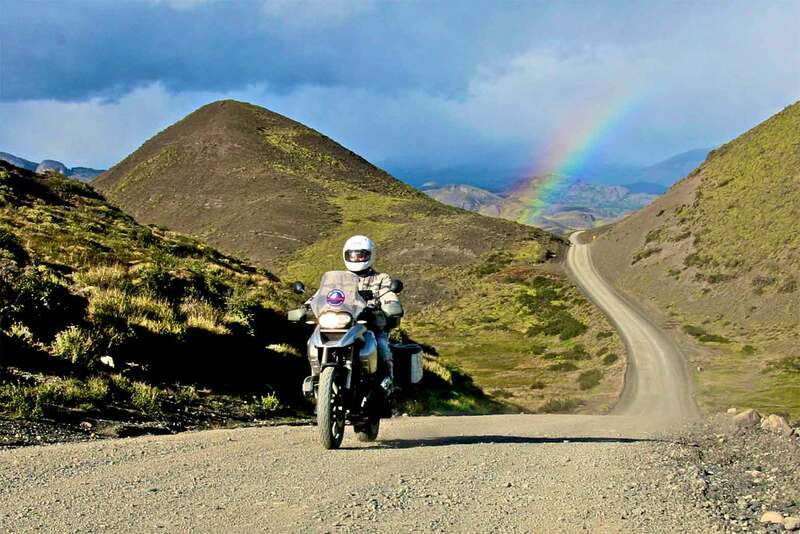 Other potential side trips include a ride to Puerto Harberton – and beyond – to the southernmost point in the world to which it’s possible to ride a motorcycle. Our final night will be at a five-star resort in Ushuaia. 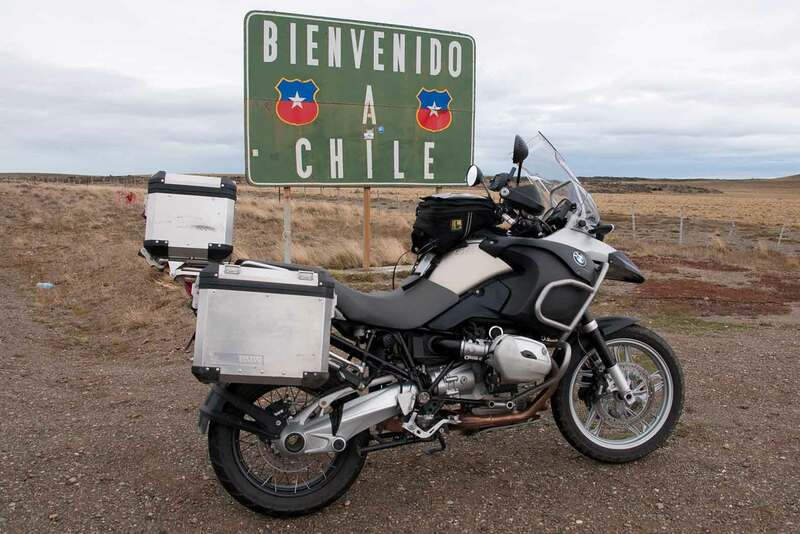 About 43 miles southwest of Esquel we will cross into Chile on the small pass road of Futaleufú. Later we turn south onto famous Ruta 7 (Carretera Austral) and continue to Puerto Puyuguapi, a quiet village located at the end of a fjord. Although it gets a lot of rain during the whole year, this remote place was the base for settlers of different nationalities, who wanted to start a new life. 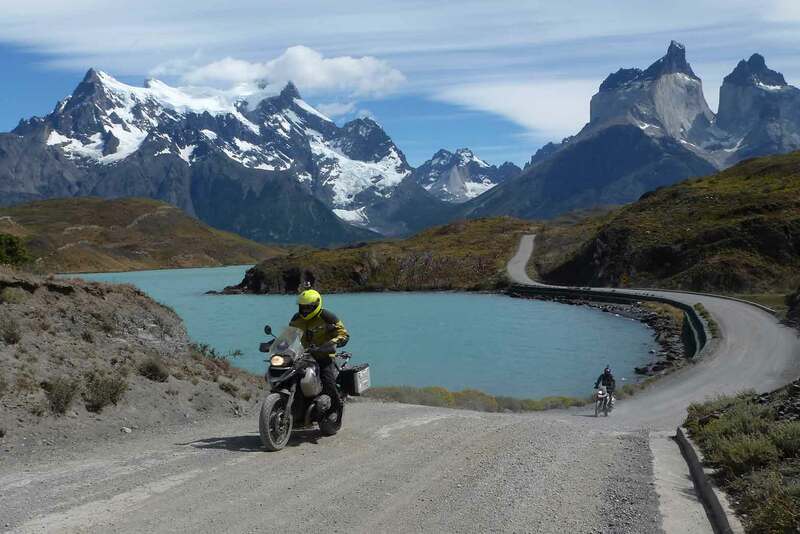 More and more sections of Ruta 7 are paved now, but it still offers its challenges due to its course through Patagonian wilderness. 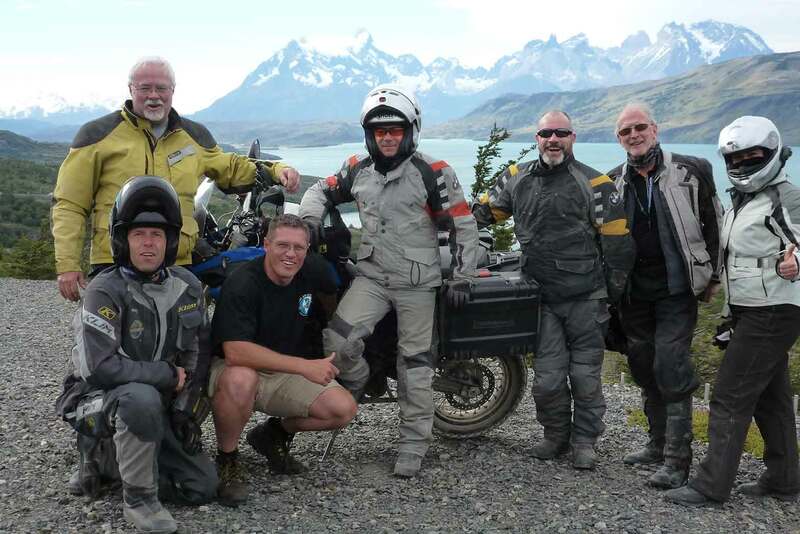 Through spectacular scenery and Chilean rain forest we continue south – paved road sections change with gravel sections and approaching Coyhaique we even have the choice between a longer paved version and a shorter unpaved one. Coyhaique with its pentagonal Plaza de Armas is the region’s only sizeable population center in this remote region. Our route today leads us through a vast variety of road types, scenery and climatic zones! 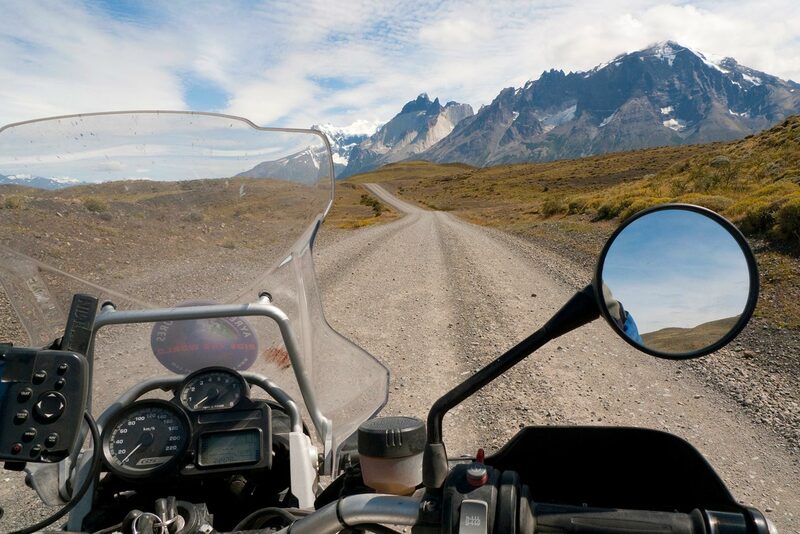 Paved and unpaved, cobblestone and soft gravel, green mountains and dusty plains, cold air in the morning on a pass road leaving Coihayque at 3000 ft and possible strong winds in the afternoon. We cross into Argentina again on a small border post. Our destination Los Antiguos is the capital of argentinian cherry cultivation and with its population of around 2000 also forms a tourist center due to its location right next to Lago Buenos Aires, after Lake Titicaca the second biggest lake of the Andes. With an early start and most parts of famous “Ruta 40” being paved now, it shouldn’t be a problem to cover today’s distance! 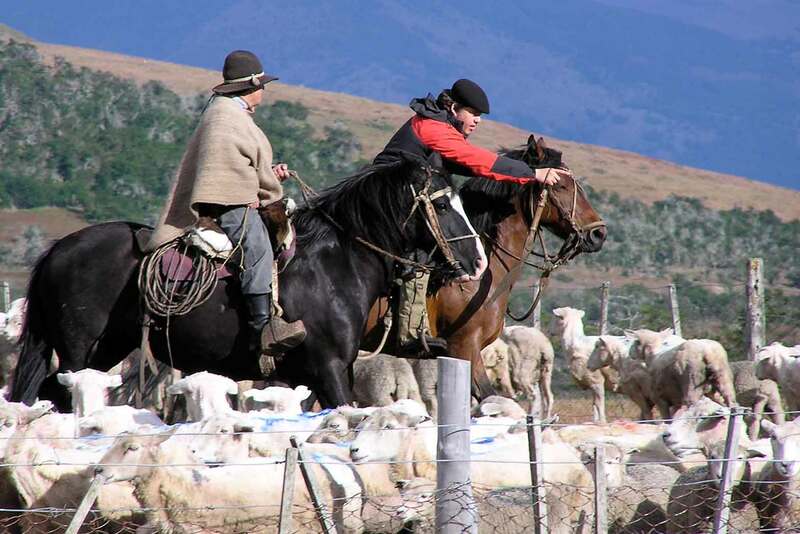 The argentinian Pampa with its endless flats and monotony has a very special magic. Possible strong side winds and short stops every now and then will keep us awake. 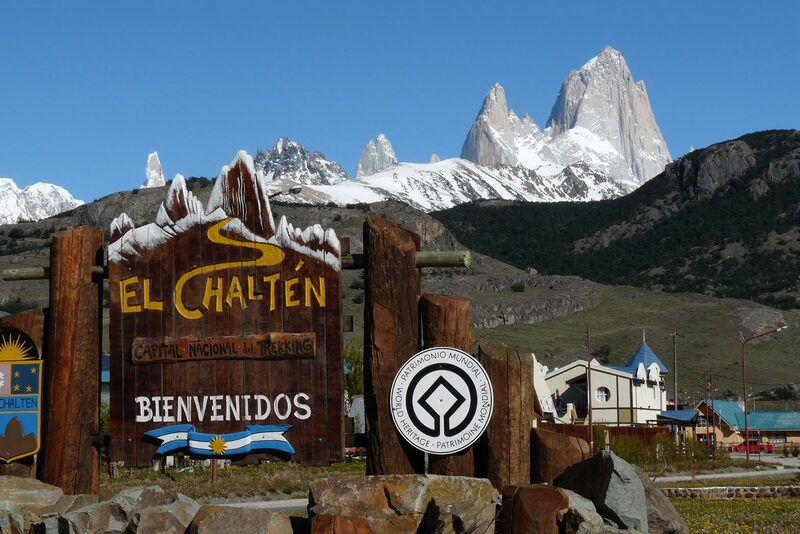 El Chaltén and the Fitz Roy mountain range will be our reward in the evening. The village has only a population of around 100 in winter – in summer, however, it’s a magnet for any kind of outdoor tourism! The mountainous scenery will follow us for some days! We can take it easy today, a late start or an additional 43 miles to “Laguna del Desierto” make up for yesterday’s long haul. We then backtrack 43 miles, before we join Ruta 40 again and continue south. 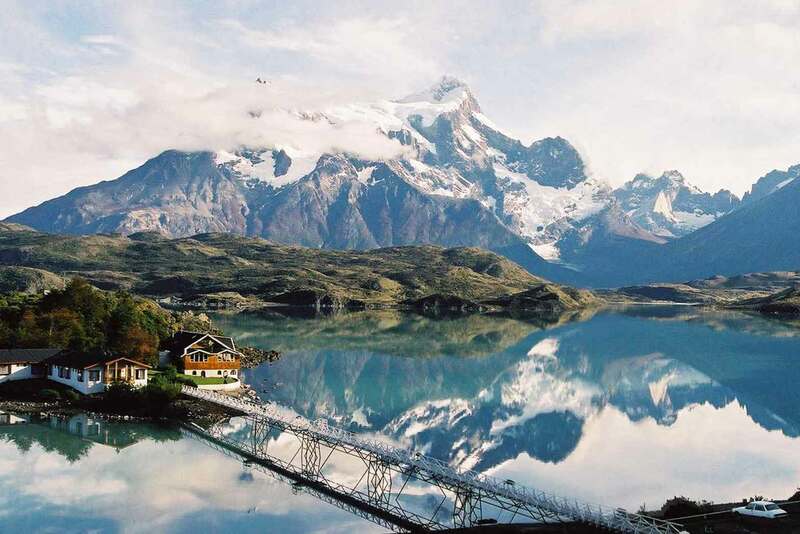 Another turnoff brings us to El Calafate at the shore of Lago Argentino, important tourist destination as the hub to visit different parts of the Los Glaciares National Park. Here we will spend two nights – tomorrow will be dedicated to the visit of the glacier Perito Moreno! 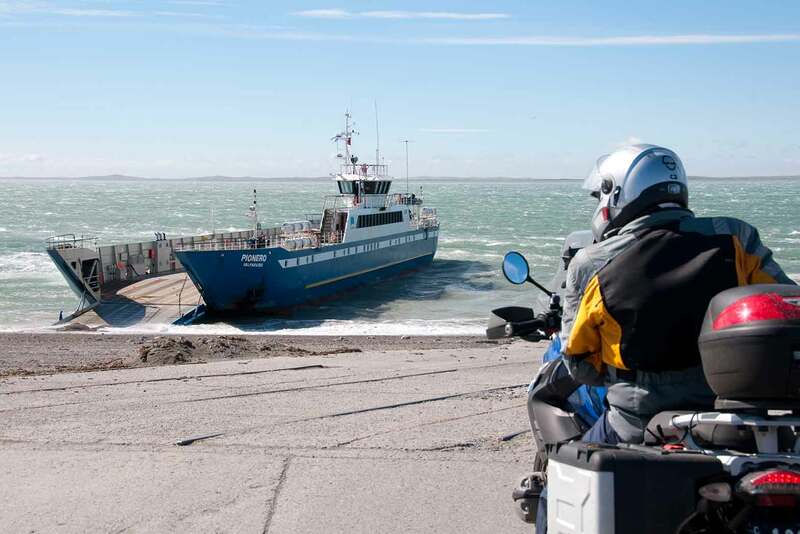 Depending on the weather we’ll either take the ferry (3 to 4 hours, depending on the weather) from Punta Arenas to Porvenir, or we’ll ride along the Straits of Magellan to Punta Delgada, where we’ll take a much shorter ferry (20 minutes) across the Straits of Magellan and onto the island of Tierra del Fuego. Either option will provide a nice ride to Rio Grande, which is located on the island of Tierra del Feugo. 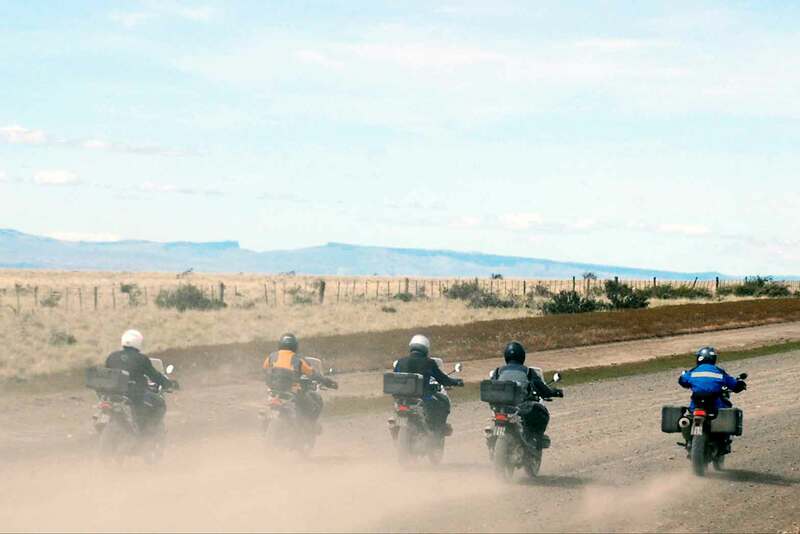 Personal motorcycle: deduct $1,950 from the rider price.